If you need more information about our 420 ultimate bus tours, take a look here or submit and enquiry! What is the 420 Ultimate Tours experience like? What separates you from other pot buses? How do I advertise with 420 Ultimate Tours? What cannabis accessories do you have on the bus for me to use? How many stops do you usually have? What if I have to get off the bus in the middle of a route? What is the 420 Ultimate tours schedule? Does the 420 Ultimate tour schedule change? Do you serve food and drinks on the bus? Are alcoholic beverages allowed on the bus? Do you offer refunds if I am unable to ride the bus? Does 420 Ultimate Tours plan to be in locations outside of Arizona? 420 Ultimate tours offers 420 friendly tours riding around going from Dispensary to Dispensary enjoying the Ultimate 420 Party Bus. Book a tour in advance. MUST HAVE A MEDICAL CANNABIS CARD. Tours will change. Please be sure to check the schedule or Subscribe to our Page. Customer Experience. We take pride in making sure our customers have a great time. If you have any complaints please contact us immediately!! We want all our customers to be educated on the best medicine in Arizona. Besides using the biggest, baddest party buses loaded full of custom features for the ultimate cannabis experience, 420 Ultimate Tours offers a unique network with curated routes that is fun, affordable and convenient for your transportation needs. Unlike our competitors, we are fully insured and licensed by the State of Arizona. Various marketing packages are available that will help grow your business. Please fill out the contact form or email info@420ultimatetours.com for more details. Aboard the bus, 420 Ultimate Tours offers the opportunity to consume cannabis any way you choose in an ultra-comfortable, multimedia environment, with curated music videos and laser light shows stimulating the senses. All the while we are taking you to great establishments around the city that offer special discounts to our valued customers. Yes. this tour is legit and you can smoke, vaporize or ingest cannabis in the rear partition of a private vehicle. No, we do not sell, distribute, give away, or offer free samples of any cannabis products. However, we are partnered with select dispensaries that offer 420 Ultimate tours riders’ exclusive discounts on their choice products. 420 Ultimate tours has an array of high quality smoking apparatuses including custom made bongs and dab rigs with e-nails and a 4 person hookah-style vaporizer. Other products will be for sale on our 420 Cannabis bar area that’s located on the bus. 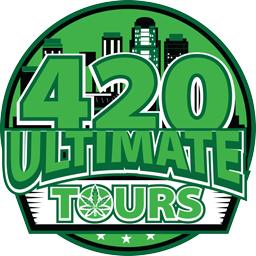 Please see the Calendar page to view 420 Ultimate tours upcoming schedule. The 420 Ultimate Party Bus has comfortable limo-style and table seating for up to 40 Passengers. Starting off we will have a 30 Passenger Bus and a 40 Passenger Bus. See tours and Book ASAP, tours will fill up fast! The 420 Ultimate tour routes are subject to change, so please check the website or app regularly for the latest routes. How much does it cost to book the bus for a 420 Ultimate tour private event? Unfortunately the 420 Ultimate buses are not wheelchair accessible. They are not, but we have stops at bars to satisfy that thirst. Passes are fully refundable until they are first scanned aboard the bus, after which no refunds are available. 420 Ultimate tours is preparing for operations in California, Las Vegas and several others states. Please subscribe to our events page. Is this really as cool as it sounds? You bet!! Check it out and see for yourself!